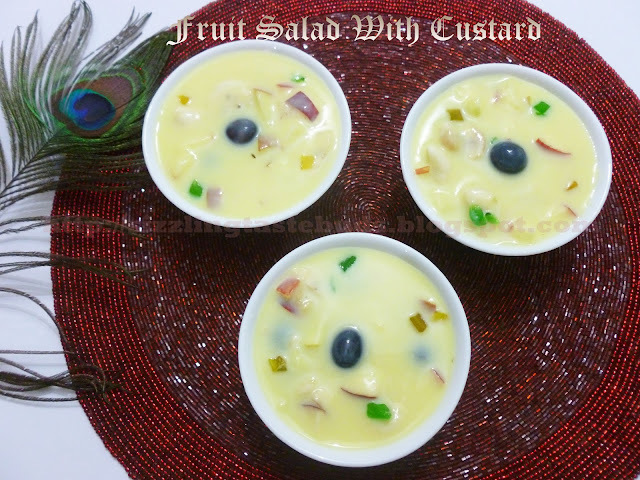 Fruit Salad with Custard is a very simple and tasty dessert. It tastes best when chilled. This creamy custard texture when paired with crunchy fruit pieces makes a healthy yet tasty dessert. This is so simple to prepare that even those who are new to this cooking world too can try and I am sure they will succeed. 1. Pour the milk in a sauce pan and bring it to boil. 2. Add sugar to the milk and check the sweetness. 3.Take custard powder in a small bowl and mix it without lumps with very little water or milk. 4. Pour this to the milk and simmer the flame. Keep stirring till the milk gets thicker. 5. Once done, switch off the stove and allow it to cool. 6. Keep this in a refrigerator for chilling. 7. Chop the fruits and add it to the chilled custard just before serving. 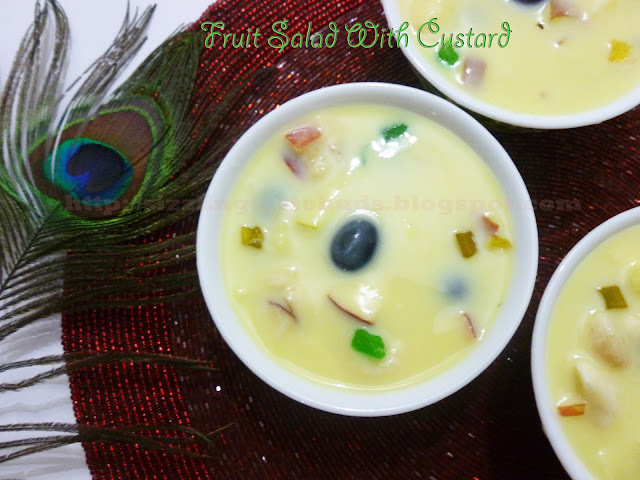 Fruit Salad with Custard is ready to be served. Note : Custard Powder comes in many flavors now- like Vanilla, Strawberry, Pineapple, Mango etc. You can use any flavors you want. Add in any fruits you like. your recipe sounds great...love it..